The PutterWheel system is comprised of a highly engineered PutterWheel and its corresponding alignment template.The PutterWheel is not simply a ball with the sides cut off. 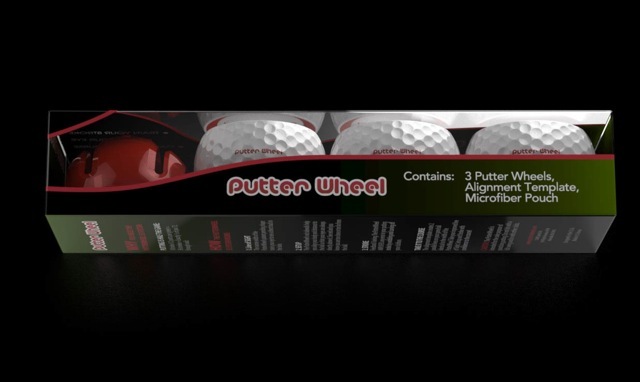 It is is designed to replicate the size, weight and feel of an actual golf ball. The PutterWheel is uniquely engineered to be highly sensitive to mis-hits, resulting in wobbling and curving off the intended line. Multiple engineering, manufacturing and testing cycles were deployed over 2 years to get the perfect combination of outer material hardness, internal weighting and other factors to provide the right amount of feedback. The red beveled edges make getting your eyes directly over the ball fool-proof. The corresponding alignment template is also an important part of the PutterWheel system. Once you have trained yourself to roll the PutterWheel smoothly on line, you can deploy that mental visualization on the course by drawing 2 parallel lines on your game ball with the alignment tool. Contains 3 Putter Wheels, our unique 2 line alignment template and a soft microfiber pouch. Packaged in the rectangular sleeve shown above, this makes a great gift for your favorite golfer. Contains 2 Putter Wheels, our unique 2 line alignment template and a soft microfiber pouch to carry the system. The 2 Pack is a good package to either practice 2 at a time on the course or have one in the bag and one at home / office. Contains 1 Putter Wheels, our unique 2 line alignment template and a soft microfiber pouch to carry the system. 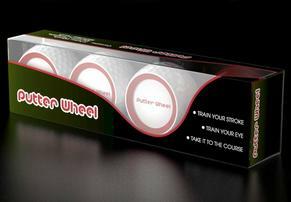 The most affordable option to start making more putts with the PutterWheel System.